Thirteen-year-old Charity Meyers lives with her father, a dermatologist whose wealth has survived the World Credit Crash, and her stepmother, a noxious vidscreen personality. 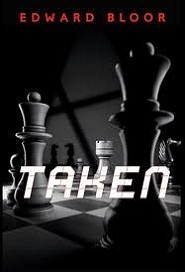 Despite all the precautions within the Meyers' high-security housing development, Charity is kidnapped on New Year's Day 2036—the taken of the title, also a chess allusion to a didn't-see-it-coming plot twist. Because child-snatching is a major growth industry in South Florida, Charity has been trained to handle the stress and she knows what should happen.